The STEAM & Creativity Lab offers students opportunities to integrate academic learning with technology and the arts while building problem-solving and critical thinking skills. Through an assortment of both guided and open-ended projects, students also learn project management skills, practice their flexibility in planning, and face the challenges of transferring a 2-dimensional design into a 3-dimensional model. Overarching themes in the Creativity Lab curriculum include innovation, inspiration, and creating an intentional growth mindset. Innovation requires students to find new or adjusted ways to accomplish tasks. Students are introduced to the five steps of the Design Thinking process and apply the steps to their own problem solving dilemmas. 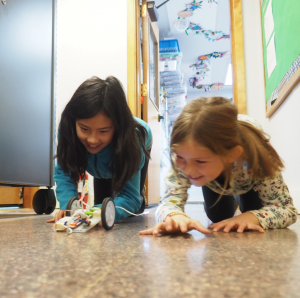 Through exploration and experimentation, students learn problem-solving while pushing the limits of not only the tools and materials available, but of their own capabilities. Inspiration comes in all shapes and forms, and students practice recognizing and using different inspirational elements in their projects. Much of the content for individual and collaborative projects comes from student interests, creating personal connection and buy-in to the work. A growth mindset is the belief that talent and intelligence can be developed and grown. In the Creativity Lab this mindset is intentionally and proactively encouraged. Mistakes are given the same treatment as successes, and students learn that the only true failure is to not try. By examining their errors, students learn to recognize the growth they are making. Third Grade Design Thinking project–in collaboration with their classroom and the library program, students define problems in the world, ideate solutions to the problem, and build prototypes of the solution.